Our goal is to publish well-read, family-oriented and useful community newspapers for the benefit of our readers and advertisers. We are committed to providing excellent service. Working together with you assures everyone the best combination of services with the best possible results. To meet these goals, we must establish certain policies and procedures. We will make every effort to see that all advertising copy, neatly presented within our deadlines, is correctly composed and printed. Proofs are provided free, for the purpose of making minor corrections. The publisher reserves the right to decline any advertising or editorial copy. Eagle Newspapers takes no responsibility for statements or claims made in an advertisement, except those placed for Eagle Newspapers. We will do our best to accommodate reasonable requests for ad placement, but cannot guarantee the specific placement of any advertisement. Guaranteed placement of an advertisement requires a 25% premium. Advertisements cancelled after being typeset will be charged at $2.00 per column inch. A tearsheet will be provided upon request. A charge of $2.00 will be charged for any additional tearsheets. Publisher’s liability for error is limited to the value of the space occupied by the error. Publisher reserves the right to require prepayment for any advertisement, including new accounts, until credit application has been submitted and approved. Past due accounts subject to 1-1/2% per month charge on unpaid balance. Annual rate 18%. All bills due in 30 days. All rates are net per insertion. Publisher reserves the right to adjust open rates at any time. Discount levels will be honored for the term of the agreement and 30 days notice prior to change will be given. Political advertising requires prepayment, ad copy must contain information on person or committee placing advertisement, open rates apply. Minimum size ad 1 column wide x 1 inch deep. Advertisements within 2 inches of the page height will be billed at full page height. Online Rates and Information • Click here for latest media kit for online rates. For more information regarding our advertising online, or to talk to a representative, click here. More choices with one buy. Our advertisers not only earn discounts in our Central New York area publications, but in our entire advertising network throughout New York & Vermont too. Click on any of the publishers below for rates, or click here to request more information on our growing network. For more information regarding advertising in our Central New York Zone, or to talk to a representative, click here. 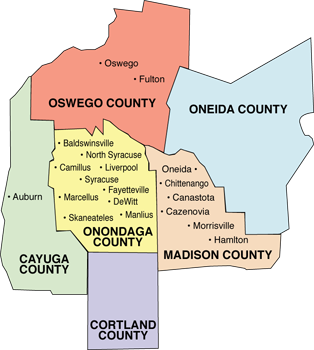 This map represents our coverage of Central New York State only. Click here for our full ad network coverage map. We offer coverage not only around Central New York, but in the Adirondacks, Albany Capital District and Vermont too! —Ask about our advertising network. Eagle Newspapers will design and print your message on colored paper. You choose the publications for your market and we’ll insert them for you. 14 day turn around from date of proof approval. Glossy, full color inserts also available. Ask your ad representative for specific details.